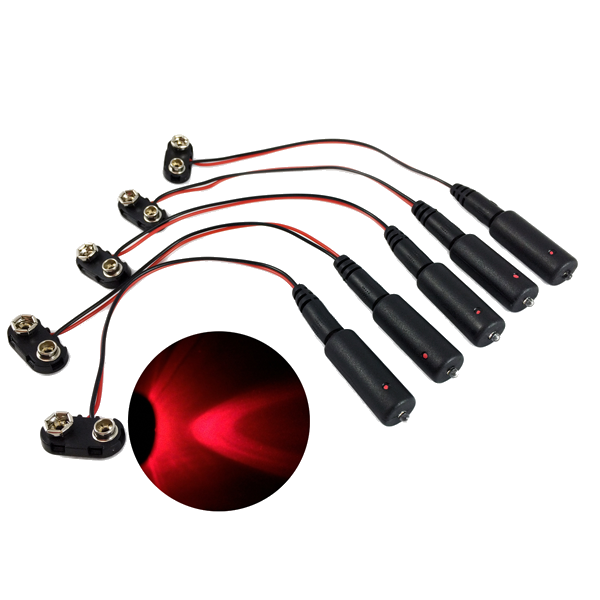 The Prop and Scenery Lights, LLC MEL-CF (Candle and Flame / Micro Effects Light) is a professional LED flame simulation light source with a built in DC barrel type connector. 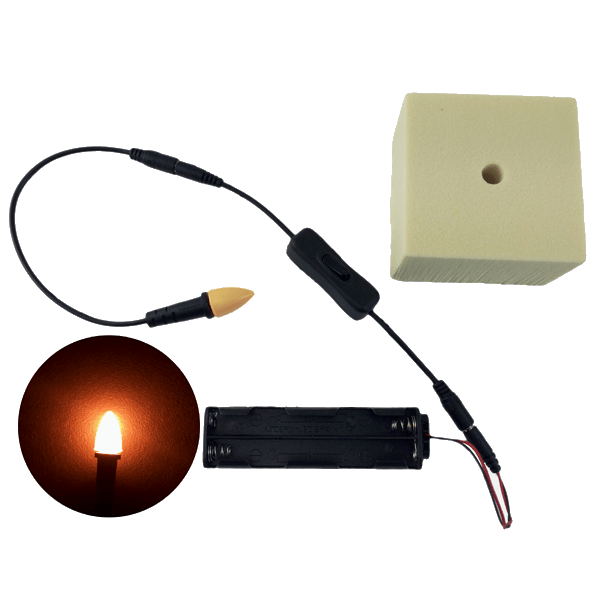 This kit includes a MEL-CF1 Candle – Flame Light, FEC1 Flicker Effects Control, and a 9 volt battery clip. Using LED lighting to simulate flames for theatrical stage, prop and scenery applications can be an elusive endeavor, yet, flameless faux fire effects are essential for a wide range of film and theatrical applications including candles, lanterns, gas lamps, and structure fires to name a few. To properly simulate a flame, the replication of two components is essential: the color temperature and the dynamic flickering effect. 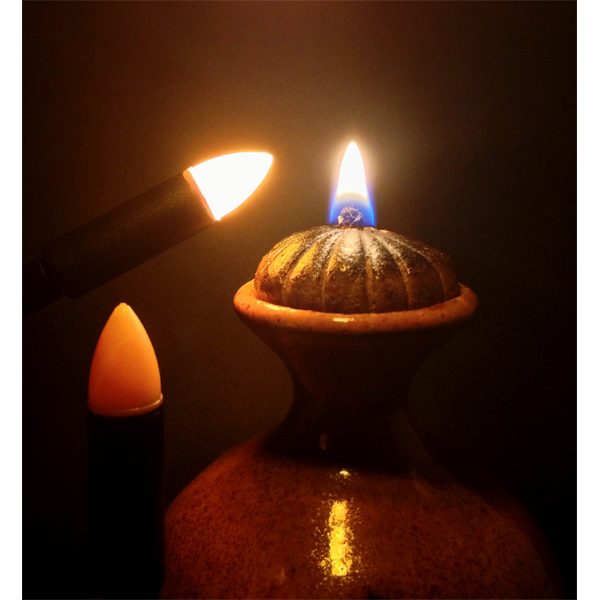 The color temperature range of flame is between 1,000 Kelvin – 2,100 Kelvin; glowing embers to candles, respectively. Historically, the incandescent bulb has been the source of choice for simulating the warm glow of fire because the filament of the bulb inherently produces a desirable spectral range of warm colored light when run under its rated voltage, such as running a 12 volt bulb at 10 volts. However, the disadvantage of using filament bulbs is its low efficiency; namely, its low light output respective to the amount of power input. Though a filtering method can be used with a filament bulb operated at rated voltage, and orange and red theatrical filter gels can be added to produce spectrum that has the appearance of a flame, the input power required is high for the amount of light output achieved. This low efficiency makes a low power portable battery operated flame source undesirable. Using LEDs instead of incandescent bulbs solves the problem of low efficiency but can appear very sterile looking due to their monochromatic nature and high color purity. Fire is not monochromatic but has a wide spectral emission with many different spectral wavelengths. An LED by itself cannot reproduce the varied wavelengths that give flames their signature warm look. Additionally, for a simulated flame to appear realistic, the flicker effect, or dynamic appearance, of their cast light is essential. Prop and Scenery Lights has several products that are designed to meet these basic criteria for a great looking simulated flame source. 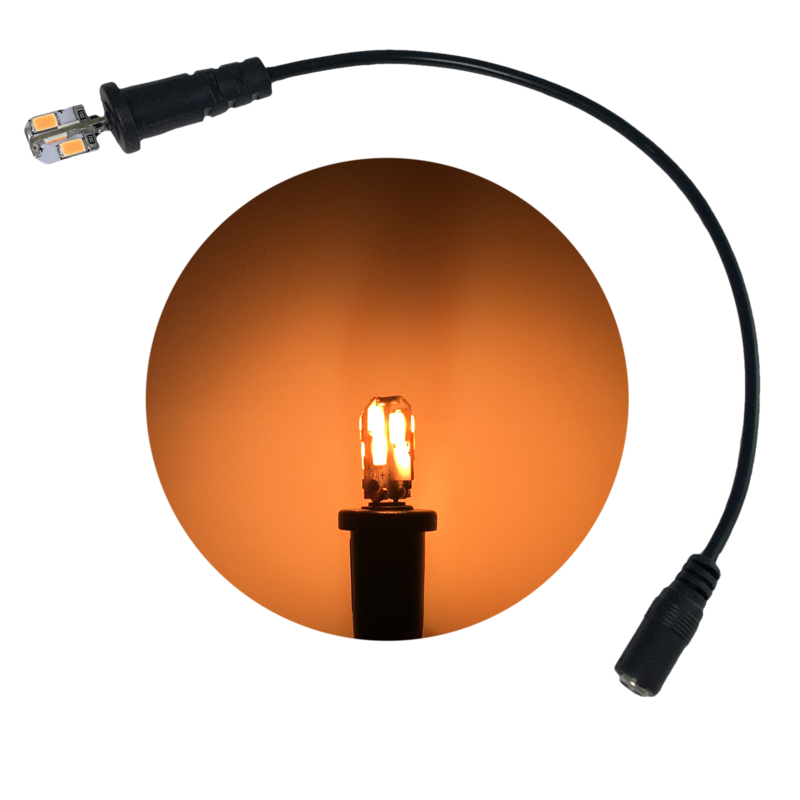 By combining an LED with a proprietary luminescent resin, the necessary color temperature range is achieved, resulting in a simulated flame with a light emission of a broad spectrum of many wavelengths of light. This provides an effective way of simulating candles, kerosene lanterns, and other fire sources with LEDs. 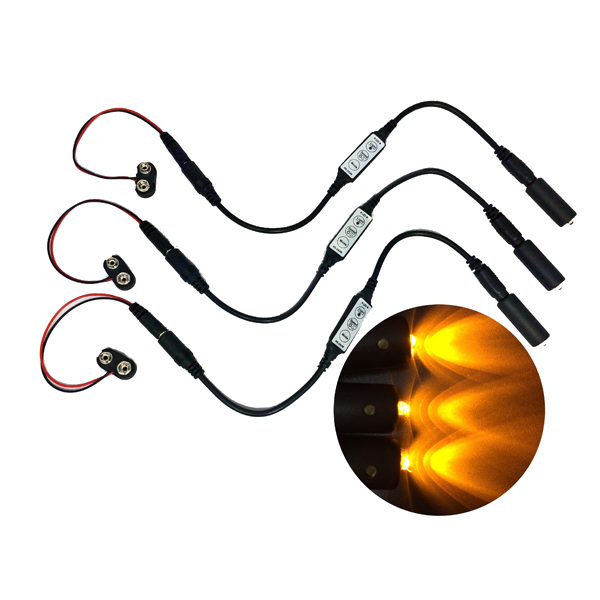 Our candle flame simulation lights are available in three types: the MEL-CF1 (Micro Effects Light, Candle Flame), the MEP-CF1 (Micro Effects Pigtail, Candle Flame), the CBL1 (Candle Bi-Pin Lamp), and the CFL (Candle Flame Light). 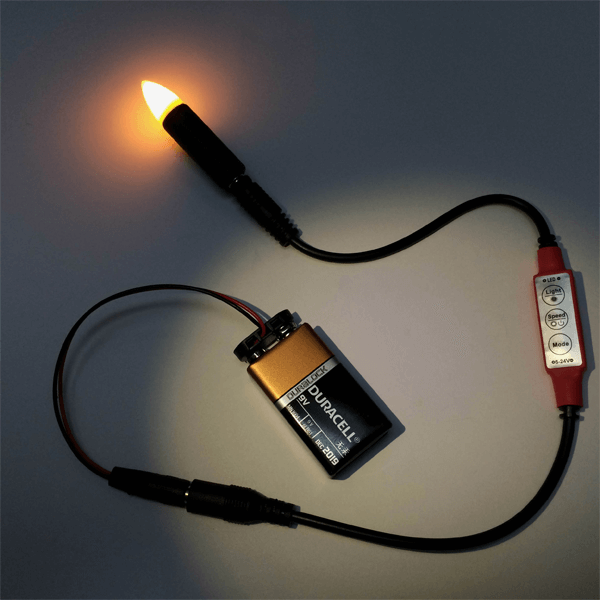 The Micro Effects Light (MEL) and the Micro Effects Pigtail (MEP) are small, flame simulation sources that are less than a ¼ watt and emit light equal to that of about two typical wax candles. The Micro Effects Pigtail can be used as a “wick” or “match” fire, simulation light as it uses a very small light emission head, roughly 3/16” diameter. The output of these flame light sources have a color temperature of 1,550 Kelvin nominal for the MEL-CF1 and 1,745 Kelvin nominal for the MEP-CF1. The Candle Bi-Pin Lamp (CBL1) is a much higher output flame light source that runs at about 1 watt with 12 volts DC. The Candle Bi-Pin lamp also provides upwards of 30 lumens of light at 1,450 Kelvin. Typical Kerosene lanterns are often rated about 15 lumens so the Candle Bi-Pin lamp provides plenty of output for many fire effects simulation prop and scenery projects. 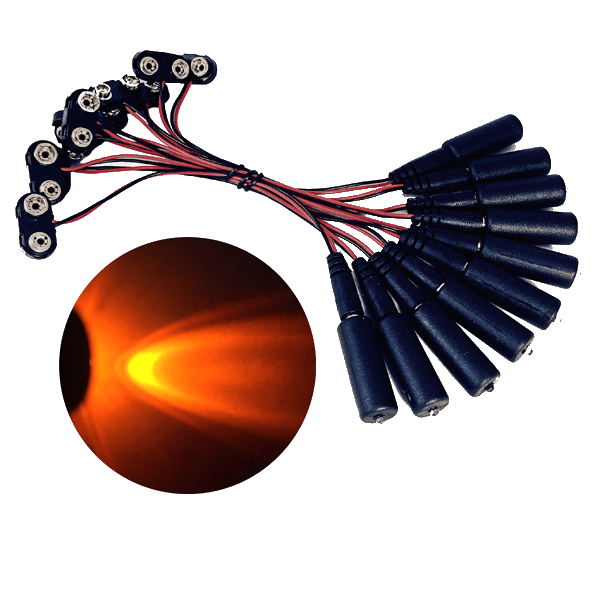 You can find these various types of LED flame simulation lights on our specialty lighting and EEL lights kit pages. 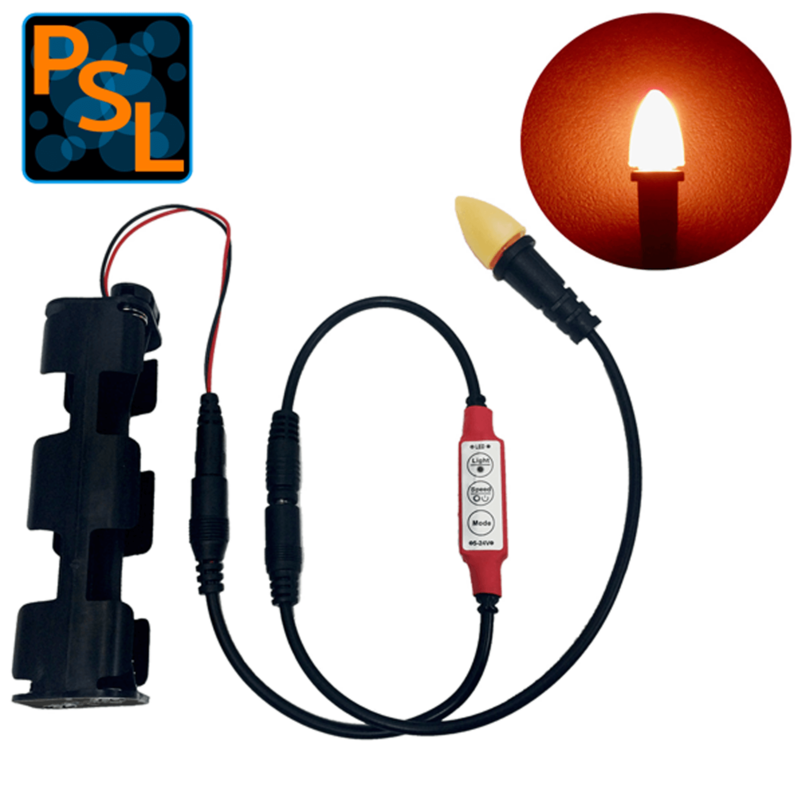 To achieve the second essential component in simulating flame, the dynamic flickering effect, PSL offers another category of product. The FEC1 (Flicker Effects Control) lighting control is a six mode electronic flicker simulation lighting control with multiple flicker speed steps. The Flicker Effects Control offers six dynamic flicker modes and one static multi-step dimming mode. The following is the product description of the MEL-CF1 Micro Effects Light – Candle Flame and the FEC1 Flicker Effects Control kitted together with a 9-volt battery clip. The MEL-CF’s average color temperature is 1,550K when all the light is integrated. The MEL-CF uses a proprietary broad emission luminescent resin that is coated on the inside of the emission dome in a non-uniform fashion which creates anomalies and variations in the light output color temperature for a more natural appearance and ambience. The MEL-CF has a wide spectral color content that provides rich toned specular reflections from scenery and objects. Flames are very complex light sources and can be difficult to simulate with LEDs because they are composed predominantly of a spectrum that includes blue, yellow and orange light. The flame emission can produce a color temperature of light typically ranging from 2,100 Kelvin (K) down to 1,000K. The flame’s emission varies throughout this range of color temperatures as it burns. The average color temperatures for specific flame sources are: candles – 1,900K, oil lamps or burning paper – 1,876K, and fast burning soft wood – 1,937K. Some flame source’s Kelvin temperatures will decrease as they burn, such as a wood or paper fire, as light is increasingly emitted from soot, glowing embers and residual matter more than the flames themselves. The MEL-CF’s light output is equivalent to that of a 1/8” diameter oil lamp or candle wick with a ½” flame when operated at 9 volts or a ¾” flame when operating at 12 volts. The MEL-CF is optimized for high light output at 9 volts DC with a nominal power of 0.18 watts operating at 20ma ref. The Prop and Scenery Lights Flicker Effects Control (FEC) has 6 dynamic effects modes and one static dimming mode. The FEC is intended for simulation of flame and ember sources such as candles, lanterns, oil lamps, fires, coals and wood embers. Each of the 6 modes is distinguished by the average light level, the maximum depth of the flicker trough, and a different flicker pattern. Modes with the softest flicker appearance have lower flicker trough depth (to 70%). Modes of greatest flicker appearance will have greater flicker troughs, 80% to 90% maximum. All dynamic modes have 10 speed steps. (step #1 fast – flame flicker) to (step #10 slow – ember glow ). (*) For fire simulation it is best to use fill and flicker light using multiple FECs and light sources. Fill light is typically a complementary light that provides an increased level of ambient light and moderates the depth of the flicker trough. The FEC is capable of a very slow rate of change in all the modes to provide fill light with more of a surging and fading glow appearance than a flicker. For more dynamic or a faster flicker appearance multiple FECs, in different modes and (or) speeds may be used with multiple LED light sources. For burning coal and ember glow simulation the slower speeds (6-10) of the FEC may be used in any of the modes. The FEC is for use with LED light sources only. The FEC retains the last setting when turned off or disconnected. 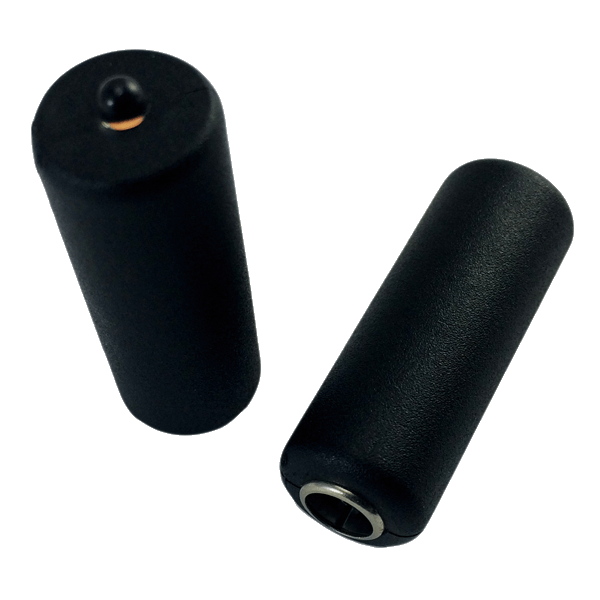 The FEC1 body measures a nominal 1.4” length, 0.6” wide and 0.2” thickness. 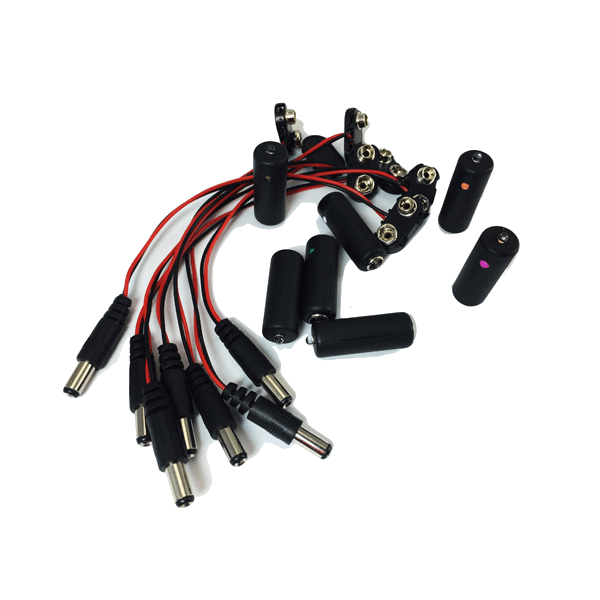 Each of the connector cables extends from the body 5.5”. 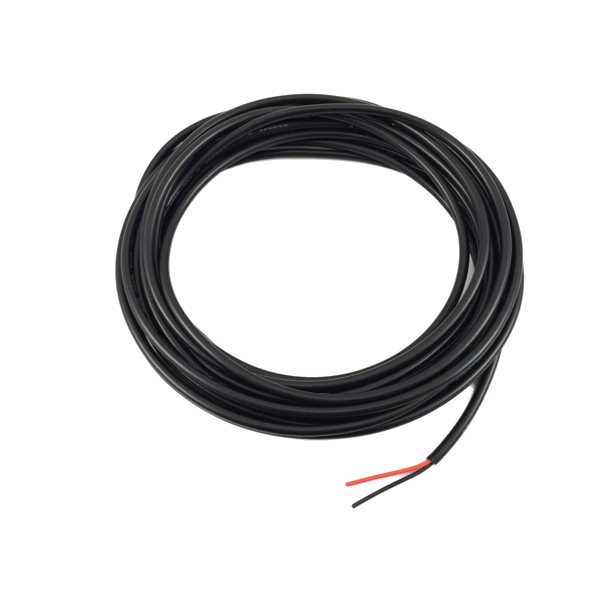 The overall end to end length of the entire FEC1 body and cable assembly is 13.0” Max. The Light, control and clip assembled have an overall length of 21″ nominal. This kit operates from 9-12 volts DC. These units operate on DC only and are not for AC operation.